With this variety of activity, our layout will never be boring. My wife does all the switching and set-outs, I just watch them run. It looks like there are no dull days in railroad ville. Aside from lack of space, the reason I don't have a permanent layout is because I could never settle on a protoype or era. 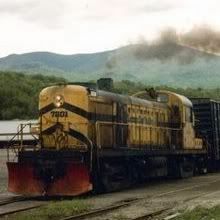 I just like the locomotives and rolling stock of too many widely separated eras: the eight-wheelers and open-platform passenger equipment of the 1860s-1870s, the early 20th century (when "big power" was an Atlantic ), and yet I have a soft spot for F-unit diesels. What's a fella to do? Since I'm disinclined to move to a large home, I do my best to make a virtue of my situation. Thank God for EZ-Track, which makes a fine base for running trains on a track that isn't fastened down permanently. Ordinarily I change out the "scenery" a couple of times a year, so I can enjoy running all my trains without the anachronism of ladies in hoopskirts and gentlemen in stovepipe hats waiting for a 1950s streamlined passenger train. However, this year so far, I've been so busy downsizing my collection of rolling stock that I haven't had time--or energy when I've had the time --to put up different scenery since I took down the Christmas scenery. Right now the track circles the table, passing through two Woodland Scenics tunnels, with no structures on the "layout" at all.